← "A Whip Is Like A Man…"
To all of you who have liked the Noreast Whips Facebook Page, thank you for taking the time to do so! It means a lot to me when customers post a video of them cracking a Noreast Whips whip, a pic of their first completed whip they’ve plaited on their own or just liking something that I’ve posted. Thank you! Lately, I’ve received many friend requests on Facebook, mostly from people that I don’t personally know. If I don’t know you personally, or have not at least corresponded with you through email, then let me say that I most likely will not ‘friend’ you on FB. Please don’t be offended. The main reason I joined FB was for the purpose of sharing news from Noreast Whips. Lately, I haven’t used my personal FB page for much of anything. Although admittedly, when signing up for an account, I did what many people do & sent ‘requests’ out to those on my Noreast Whips email list. In hindsight, I would do this differently if given the chance. 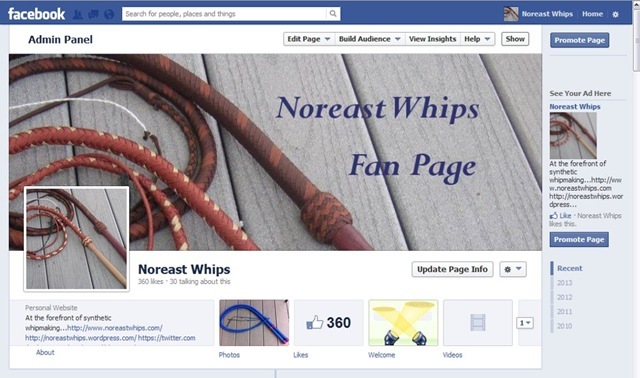 If you have sent me a friend request on FB, please consider ‘liking’ the Noreast Whips FB Page. This way you’ll be able to receive any news, upcoming contests, new products & new pictures related to Noreast Whips. I don’t usually post anything whip-related on my personal FB page. Thanks again to all of you who are fans/likers of Noreast Whips! Your posts & support mean the world to me. Without you, there would be no Noreast Whips. Man, you and I must be on the same wave length! I was thinking of posting a blog about this myself. I did once a couple of years ago, but thought it was about time to do it again because I noticed an increase in friend requests from people I don’t know. Right now I’ve got about 30 unconfirmed friend requests, mostly from people I don’t know but I can tell are part of the whipcracking community or friends of friends, etc… I don’t blame folks for wanting to get to know others in the community better, but I think that my fan page is the better option also because there they will be spared from the rants, raves, and political drivel I post on my personal page. Rhett, that’s funny stuff! I’m willing to bet that anyone with a fan page or ‘like’ page or whatever it’s being called now, lol, may have the same issue. It’s nice when people reach out and it’s always appreciated! Yet I feel that groups & fan pages that are more subject-specific are better in general. I don’t want to bore anyone either, lol. Btw, for some reason I’m not receiving all comment notifications in my email, which is why I’m responding so late. It seems I usually get the spammy ones, though. I’ll check the settings again.